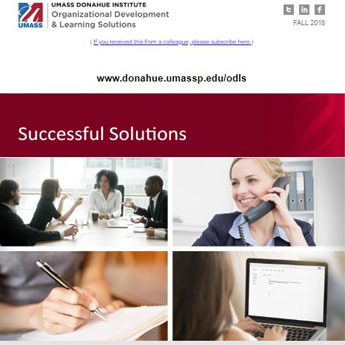 Read past issues of Successful Solutions, the newsletter of Organizational Development & Learning Solutions at UMass Donahue Institute. To receive future issues, subscribe here. 2018 Winter: Workplace diversity, Workforce Planning, Client Spotlight: Massachusetts Trial Court, Recommended Vendor: Morgan, Brown & Joy, LLP, Contractor Spotlight: Vanessa McClinchy. 2015-2016 Winter: Training grants available from Mass, virtual training options, event managment, baby boomer retirements and the "knowledge gap"